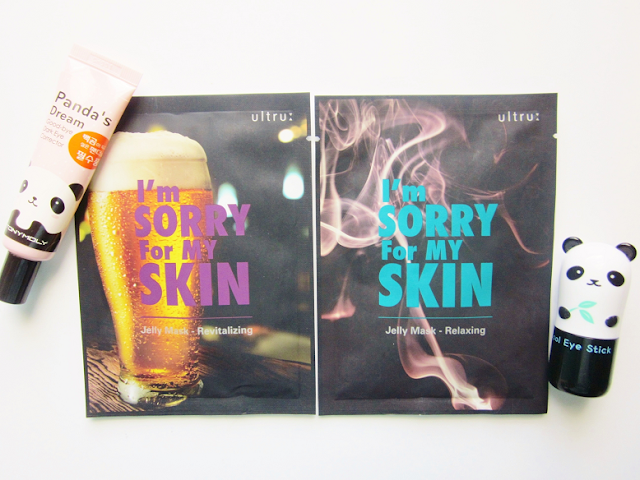 Earlier this month I bought the Snack and Mask Memebox which included the Ultru I'm Sorry For My Skin Jelly Masks. These s masks are unlike other sheet masks because they use a jelly essence to hydrate the mask. I first heard about these masks through a Korean Youtuber and since that review I've wanted to try them. Today I will be reviewing all four masks and whether they lived up to the hype or not. "Ultrue's I'm sorry for my skin's jelly essence contains AMF, which is a specialized moisturizing agent that resembles skin's natural moisturizing agents. It also contains our desert blend, a mixture of extracts from plants that survive in extremely dry climates. The essence helps skin maintain a healthy oil-moisture balance. This helps the skin maintain it's optimum condition for a long period of time. It also helps the skin build a stronger protective barrier against dry weather conditions so that it holds onto its moisture." "Yes, you can eat all the ice cream you want, and still have luminous skin! This super fine sheet mask is formulated as a detox mask that is drenched in jelly form essence for maximum nutrition and pore care. Using a proprietary water wrap technology (AMF), this mask contains a desert plant content that is curated to provide 120+ hours of long lasting hydration." "Moisturizing and brightening for tired and dry skin. This super fine sheet mask is formulated as a detox mask that is drenched in jelly from essence for maximum nutrition and brightening. Using water wrap technology, this mask contains a desert plant content that is curated to provide 120+ hours of long lasting hydration." "Revitalize, hydrate and relieve skin from drinking! This super fine sheet mask is formulated as a detox mask and is soaked in jelly form essence. Using Ultrue's patented water wrap technology, this mask's desert plant extract provides 120+ hours of hydration."" "Smooths and relaxes your skin by relieving the sensitive areas irritated by environmental impurities. This super fine sheet mask is formulated as a detox mask and is soaked in jelly form essence. Using Ultrue's patented water wrap technology, this mask's desert plant extract provides 120+ hours of hydration." I honestly didn't notice a difference with each mask. They all seemed to work the same. With that said, I love how these masks made my skin feel! After each use my skin felt super hydrated, moisturized and soft! I especially love how much leftover jelly essence there was. I had enough to reapply the next morning and night! So far you can only find these masks on a few websites. 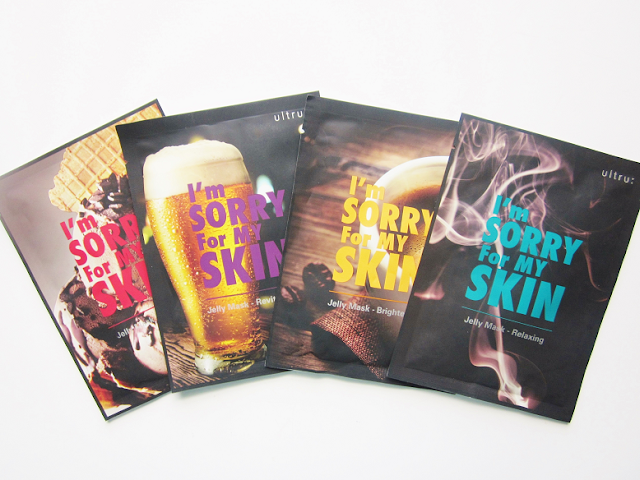 Since I bought these from Memebox hopefully they will decide to carry the I'm Sorry For My Skin Jelly Masks individually or in sets. Have you tried any jelly masks before? Is there any scent to each masks?